In July of 2011 my good Friend David Welte and I set out to conquer Algonquin Park’s Brent Run. After completing The Run I made a number of notes that I will share in 4 parts. Enjoy!! Come March, Dave had committed to doing The Run with a healthy enthusiasm. We started training and planning. Research would be key to our success, but there was very little to be found (one of the reasons for this website). There was one online account about a trip completed by Nick Best and Mike Dobson in 2008. This account seemed reliable and provided a very detailed account of the route. This became our primary source of information. Being several thousand Kilometers apart (Dave was living in Vienna, Austria) proved difficult for our planning, but we managed to piece together the trip specifics. We would leave for Algonquin Park and make base camp on Canoe Lake (not knowing at the time that The Park did not offer any backcountry camping on Canoe Lake). We would aim to tackle the Brent Run as close to the Summer Solstice as possible to maximize the amount of daylight available to us. If we left our campsite at 6am we would have approximately 16 hours of daylight. Ideally we would make it to Brent within this time and with the help of GPS we could easily navigate the return trip through the evening part of the trip. Physically Dave and I were both in ‘pretty good shape’. We made sure to challenge each other with various workout routines and we both felt confident in our physical abilities as we approached the trip. Regarding supplies we would pack relatively light. We would have all the creature comforts for our base camp, but while doing the Brent Run we would pack light. We planned on taking the following: water filter, first aid kit, camera, rain gear, map, compass, GPS, bug spray, sun screen, water supplements and food in the form of Power Bars, Cliff Bars, Trail mix etc. After months of preparation and excitement for the trip, we thought that we were ready to go…we were wrong. 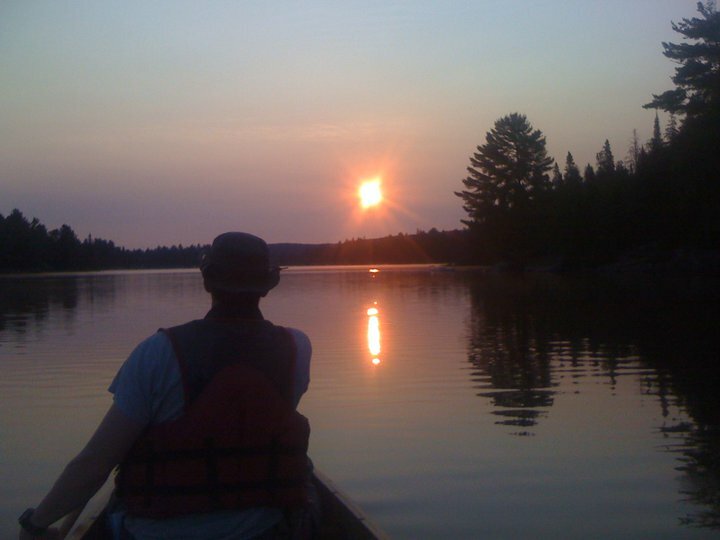 Dave and I set out on Monday July 4th, 2011 for Canoe Lake Algonquin Park. To say that the trip didn’t start off well is an understatement. In my haste to leave the house to pick up Dave, I managed to leave my map case which has my map, compass, camera and spare batteries. Upon reaching The Park we were disappointed to hear that there were no camp sites on Canoe Lake so we booked a site on Joe Lake (this changed our plan and essential forced us into a modified Brent Run). After a relaxing night we started out at 6am on Tuesday July 5th. Our plan was to push forward to Brent before nightfall. We would GPS the entire route so that night navigation on the return wouldn’t be an issue. We made, what we thought, was good time through Little Joe and Baby Joe lakes. This brought us to Burnt Island Lake which took us about 1.5 to 2 hours to pass. A 700+ meter portage took us into Little Otterslide Lake where we stopped for a quick snack. Little Otterslide brought us to Otterslide Lake and then into Otterslide Creek. This is an old winding creek with a strong downstream current. It proved difficult to navigate and there were a number of other canoes which slowed things down for us. After Otterslide Creek we made Big Trout Lake. This is a very large and windy lake where we stopped for lunch on an island. We had been on the water for 6 hours. I will admit that by this point I was becoming nervous and anxious about the trip. We were less than half way to Brent and we had been on the water for 6 hours (approximately a 5th of our goal time of 30 hours). Dave and I chatted and he thought and that we should push on even though my gut was telling me different. I actually felt close to panic as we pushed on. Big Trout Lake proved to be a tough one because of it’s vast size and a very strong headwind. Next came Longer Lake which turns into Red Pine Bay. We saw a couple of moose in this section which was pretty cool and proved to be a big distraction for us. Next was a large lake called Burnt Root Lake. The wind on this lake was a very challenging crosswind especially given how tired we were at this point. We succeeded in getting into Perley Lake. No issues going through here and we saw a couple of more moose. Perley Lake opens into the Petawawa River and then into Catfish Lake. Catfish Lake turns northeast into Narrowbag Lake. The time was 9pm and we had finally made it to the most challenging portage on the route. This portage measured 2350m and with fleeting daylight it was challenging. Dave and I pushed hard to complete this portage before we lost all light. We split it into 4 sections and took turns with the canoe. We completed the portage in about 35 minutes and we were back in the Petawawa River. One last 700m portage and we were standing on the south side of Cedar Lake. Our half way destination of Brent was located on the North side of this lake. As we started to set out, the sky lighted up as a massive bolt of lightening striking northwest of Brent. Decision time; should be push on in hopes that the storm would miss us, or should be settle in and wait for the storm to pass. We decided to push on. The crossing of Cedar Lake was a scary one. The wind was strong and the waves were rolling high. It was also pitch black by this point and our only source of reference were some cottage lights on the north side of the lake. We finally made it into Brent at about 12am, 18 hours after we set out (and well behind schedule). We touched down on the North shore or Cedar lake and immediately headed back south. The storm was getting precariously close by this time. Dave and I headed south on Cedar Lake for another precarious paddle. A shift in the winds brought the thunderstorm down on us just as we reached the southern shore. We put in at the first campsite that we saw to get off the water and to find some shelter. Dave managed to start a fire and we cooked up some warm food. After eating, Dave and I decided to grab some shut eye while we waited for the storm to pass. I huddled under a log bench by the fire in my full raingear with my life jacket as a pillow. Needless to say, I didn’t get much sleep. We rose at 5am and much to our thanks the thunderstorm had rolled through. We hit the water at 5:30am. Shortly after we had set out, the sky turned black and we were met with a driving rain. This rain continued to drench us for the next 4 hours. We continued to push forward. I started suffering from some GI issues and had to make a couple of pit stops on shore (pleasant…I know). We ate breakfast on Catfish Lake and then headed south (by this point in time we were both thoroughly exhausted). Thankfully favourable winds through Burntroot, Longer and Big Trout Lakes helped us and our morale built as we made good time. Otterslide Creek was challenging due to the strong current working against us this time. We made it into Burnt Island Lake as the sun was setting. This was by far the most difficult lake to cross. We were exhausted and the lake was long (it took us about 2 hours to do it on the way out). We stopped several times to rest and to collect ourselves. With the last rays of light fading, we made it into Baby Joe Lake. By this time it was pitch black and difficult to see. Also working against us was a thick fog which rendered our headlamps pretty much useless. The GPS was long dead by this point and navigation into Little Joe Lake was slow and even slower on Joe Lake. We really didn’t have a good bearing at this point. Before too long we spotted the lights of Arowhon Resort which gave us a rough idea of our location. From there we just hugged the south shoreline of Joe Lake where our camp was. Suddenly, almost out of nowhere, our tents appeared through the fog. It was 11:24pm. Total Brent Run trip time was 41 grueling and glorious hours and I vowed never to do it again.